During the long winter season and in the summer months, you will find lots of things to do in Bansko. Without doubt, one of the most popular things to do in Bansko is ski and snowboard. You can find out more about this on our Skiing in Bansko page. The route from the top of the mountain down to the town is floodlit one day a week so that you can ski the last 6km from Banderishka Polyana down to the gondola station. From there you can have something to eat or drink in the Happy end bar, or a short downhill walk will take you back to the apartment to put your feet up. If you’re looking for fresh untouched powder, then one of the best things to do in Bansko is take a guide and explore the limitless off piste opportunities will satisfy even the most demanding skiers and snowboarders. For the adventurous, you can take a helicopter away from the resort and deep into the Pirin mountain range and take on some of the backcountry slopes. About 5-10 minutes walk from the apartment is Banskos very own ice skating rink. Great for winter evenings. Why not jump on a ski-doo and plough through the woods Jame Bond style accompanied by a local guide. For the more athletic, Bansko offers several km of cross-country ski tracks with shooting ranges. What many don't realise about Bansko is that it is only a couple of hours drive from the Mediteranean and as such if benefits from much of the hot weather during summer months. As well as outdoor pools open at a number of the hotels, the mountains and rivers bring plenty of things to do in Bansko outside of the ski season. One of most enjoyable things to do in Bansko from Easter on, is hire a mountain bike and explore the mountain trails. Over the last few years, mountain biking has really caught on in Bansko, with a number of annual events promoting the sport. The large forest areas and mountain trails make it the ideal place for mountain biking. A popular route is to the Belizmata reservoir 3km South-West of the town. You will find it by crossing the bridge near the Bansko Hotel and going straight until the first field track. Mountain bikes can be rented by the day for 20 Lev (about £7) from the ‘Mountain Tracks’ shop on Ulitsa Pirin (0888 788859 / 0888 703184). This is a 5 minute walk from the apartment. 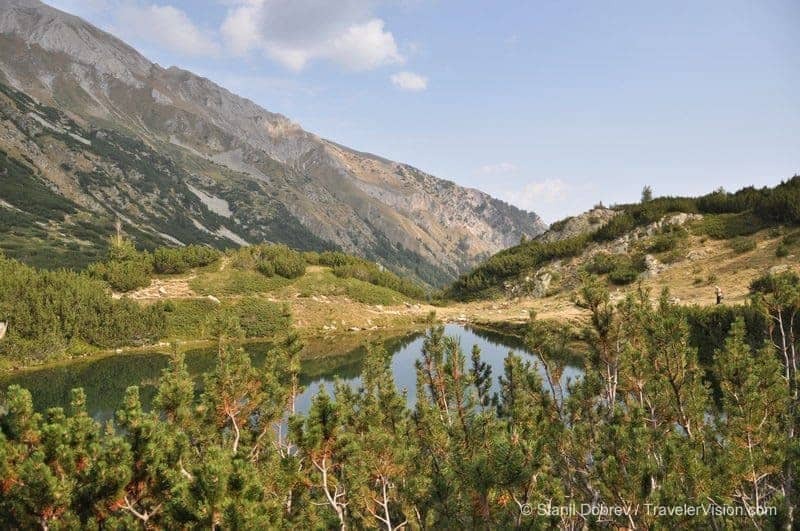 The Pirin mountain range has for a long time been a popular hiking destination in Europe. The hiking season is from early June until late September and is one of the most popular things to do in Bansko outside of the ski season. For extended tours, you can take a 2 or 3 day hike around Mount Vihren and the lakes on a circuit beginning or ending at a hut that is accessible by Road from Bansko or Dobrinishte. The mountain huts provide both shelter and overnight stays. Early summer provides some spectacular category 2 – 5 white water rafting on the Struma and Mesta rivers, as the snow from the mountains melts and flows along these main rivers. Rafting day-trips are available on both rivers both rivers with guide and lunch provided. Routes for rock climbers provided with all utilities have been provided on the north face of mount Vihren and the mounts Samodivski and Glavnishki Chukar. A great way to explore one of Europes most unspoilt nature reserves. Maybe stopping for lunch in a forest glade or taking a rest beside a clear cool mountain stream. Set at the very foot of the impressive Pirin mountains, the 18 hole Bansko golf course is probably going to be one of the best in the country for quality and facilities. The course was designed by golfer Ian Woosnam and was buit by IMG. The course opened in the summer of 2007. Aside from golfing, there are a large number of things to do in Bansko's golf resort that appeal to everyone. Such as a new sports complex which will include a football pitch, 2 tennis courts, volleyball and baskball courts, horse riding centre, spa centre, mineral water swimming pool, sauna, hydro-massage baths and a wide range of alternative therapies designed to relax. The complex will also include a shopping centre and numerous restaurants and cafes. So if not everyone in the group shares the same passion for golf as you do, there will plenty to see and do while you enjoy a round of golf in peace and quiet. One of the most exciting, yet peaceful things to do in Bansko is to view the Pirin mountain range from the air. Accompanied by a pilot, your flight will take you from the top of the Todorka mountain down to the nursery slopes at the bottom with incredible views and a very real sensation of free flying. The trip costs around 150 Leva (about £50). You can find more information byclicking here to visit their website. If you still need convincing, click here to see some footage from a paragliding flight taken in Bansko. Hang gliding flights are also available in Bansko. There are about 4620 known caves in Bulgaria..Most of which have been explored and many available with guided tours. The most popular being the Yagodinska cave. What better place for a complete off-road experience. The narrow dirt tracks and rugged countryside provides virtually unlimited off-road tracks, winding in and around the mountains, through rivers and across rugged terrain. Surrounded by lakes, Bansko has some excellent locations for fishing. Chances are, you will have an entire lake to yourself so you can relax, unwind and admire the stunning backdrop of the Pirin mountains. Children aged 4 and up are welcome to join the Junior Ski Club that will attend to their first steps in skiing amidst lots of fun and entertainment. Along with memorable memories kids also get a small present to take home and the option for further discounts. Conveniently located on your way to and from the base station of the Gondola lift, the Non-Skiing Kindergarten welcomes children aged 3 – 7. Supervised activities, fun and games, and special entertainment take place Sundays through Fridays from 9 to 5. You will find a wide variety of shops in Bansko selling everything from clothes, ski and snowboard gear, souvenirs, electrical goods, bikes, lamps … the list goes on. The shop-til-you-droppers will be glad to know that there is almost always a cafe in sight, most serving speciality coffees, soft drinks and alcohol together with a selection of local pastries and other snacks. Many shops close for siesta at around 1pm and re-open at around 3pm, staying open until 8pm in the evening. After hours, many shops stay open 24hr selling beer, wines and spirits as well as food, snacks, sweets and other everyday items. The nearest 24hr shop is about 5 minutes walk from the apartment. On Sundays, the market comes to town. Behind the square is the fruit & veg market, where you can sample some of the local organic produce. After a few days working out on the slopes, one of the best things to do in Bansko is to visit one of the many health spa's to recharge the batteries. Next to the apartment is the Belle Vue, where for a small cost, you can enjoy the facilities of their health spa. Among the facilities are an indoor heated swimming pool, a sauna, a jacuzzi and a turkish bath. You can also enjoy a wide range of alternative therapies, with everything from massage to reflexology available. The best known of Bulgaria’s monasterys, justly famed for both its architecture and mountainous setting. Although you may wish to visit the monastery on a packaged day trip it is perfectly possible to get here independantly and the abundance of trails leading off into the densly forested hills make an extended stay more than worthwhile. Though the monastery gates are open daily to visitors from dawn till dusk, some of the sites within the complex keep more restricted hours. If you want to see a service, morning prayers start at 7 or 8am, evening prayers at 4 or 5pm. Services are preceded by monks hammering on wooden panels in the monastery courtyard, a ritual designed to remind the congregation of Christs nailing to the cross. The start of the Saturday evening service is usually announced by a monk ringing a carillon of bells from hrelyos tower. While the Thursday morning service is traditionally dedicated to St. John and features sacril chanting throught to date the 15th century. Apart from Easter, the two main religous festivals celebrated here are the birthday August 18th and feast day October 19th of St. John of Rila. The smallest town in the southwestern Pirin Mountains, about 440 m above sea level. The town is an architectural reserve with 96 of its buildings listed as cultural monuments. Melnik is popular amongst both locals and tourists for its unusual landscape of sandstone formations, cliffs and pyramids as well as it’s robust red wines. Melniks layout is simple, with a single main street running alongside a riverbed spanned by rickety foot bridges then diverging into two gullies. Tiny back streets invite aimless wandering, while the hillsides are abound with tortoises and lizards. Kordopulov House (opens daily from 8.30am to 12pm and from 1.30pm to 6pm for about 5 lev) protrudes from a rocky shoulder above the gully with twenty-four windows surveying every approach. The first floor, is now a Mehana (bar/restaurant) providing spacious yet intimate rooms. The reception room, a superb fusion of Turkish and Bulgarian crafts, with painted panelling, rows of cushioned bench seats, intricate lattice work ceiling and a multitude of stained glass windows. Below ground are the wine cellars, huge wooden barrells occupying vast caverns cut from the hillside, connected to the vinyards at the rear of the house by a network of tunnells. The Yagodinska Cave is the “pearl in the crown” of the Rhodope Mountains. It is situated near Buynovska River, 3 km from the village of Yagodina. The cave is a part of the unique Karst of Buynovsko Gorge. It is 10 km long, and 5 stories high, with many labyrinths and abysses inside. Visitors enter the cave through an artificially dug opening, while the natural entrance is 30 m above.A special path through the cave offers the opportunity to see the wonderful underground world formed in the course of millions of years. Atmospheric lighting illuminates the mysterious formations. Draperies, pipe-like stalactites, cave pearls, “leopard’s skin” and hanging stalactone visible along with many others. Some of the formations inside resemble the well- known Santa Claus, Snow-White and The Seven Dwarfs, Virgin Mary and her newborn child, the Elephant, the Crocodiles and hundreds more. The spa resort is situated in a mountainous area at some 550m above sea level and close to the Mesta river. The area is rich in mineral water springs, which had already been used during Roman times. The remains of Roman spa facilities have since been transformed into the village`s public bath. Ognyanovo offers perfect conditions for recreation and spa treatment all year round with its mild mediterranean climate. The mineral water temperature here is 43 degrees and is used for the treatment of a number of illnesses. Why not take the Mountain train to Belitsa or Velingrad. The narrow-guage railway winds through the mountains with the most spectacular scenery. There are organised trips taking tourists from bansko to Velingrad or Belitsa, where you can visit the bear park as mentioned earlier. The organised tours include return transfer and a traditional Bulgarian lunch.